Cottons, velvet, silk, fancy trims, embroidery and smocking. All this and more defines our special occasion wear, party dresses, communion dresses, etc. - those truly special outfits for that special day. Below are a few examples of our favourites. A beautiful and elegant party dress. The velveteen bodice has slightly puffed sleeves. Victorian style rococo ribbon flower trim in shades to match the skirt, adorns the sleeve bands and the squared neckline. 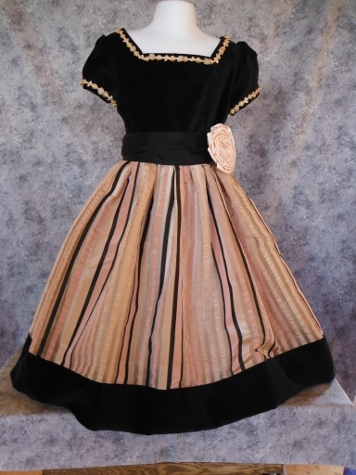 The full tea length gathered skirt of striped silk organza has a 4 inch velveteen hem band and an attached underskirt. A black silk dupioni sash lined in the same striped organza as the skirt, encircles the waist. The finishing touch - a hand rolled whimsy rose of wide silk satin ribbon. A field of flowers dance across this lovely dress of printed cotton. A heavily smocked bodice is piped at the yoke and the mid-bodice line. 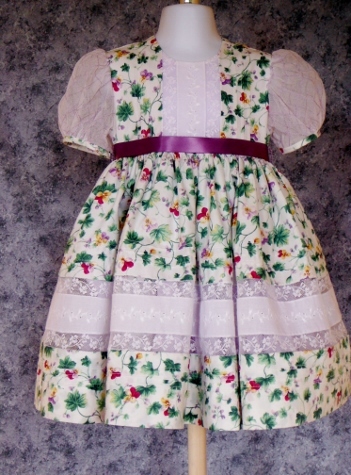 The same piping is echoed at the contrast sleeve bands and around the Peter Pan style collar. The skirt is tightly gathered at the waist and closes at the back with 4 fabric covered buttons. A contrasting wide cumberband sash and a detachable bow complete this beautiful outfit. Sweet & delicate - a dress that will make your little one the belle of the day. A smocked bodice with a bound neckline, puffed sleeves and piped at the waist. The neckline and the sleeves are trimmed above the bands with a simple lace edging. The gathered skirt is also edged with the same lace. A contrast sash is gathered and attached at the side seams, to tie into a bow at the back of the dress. The gallery shows this dress in 2 different prints with 2 different smocking patterns. This silk dupioni dress is truly a treasure to be constructed for your precious little girl and then be passed down through future generations of your family. The high yoke bodice has delicate machine embroidery in the center with tiny silk piping at the bottom of both the front and back yokes. The puffed sleeves have a silk organdy inset with antique cutwork machine embroidery and are finished with entredeaux, French beading with silk satin ribbon and gathered French edging. Entredeaux and gathered French edging finish the neckline of the lined bodice. Teardrops of French lace filled with embroidered organdy insets dot the skirt which is finished with scalloped French lace insertion and double silk organdy hem. Available in sizes 2, 4, 6 & 8. Starting at $185.00. This dress is a sweet treat worthy of any celebration. It says "You're so special" and "Celebrate" all rolled into one. Designed in a mid-yoke style, the bodice has a round neck and button back. Short puffed sleeves are gathered into a cuff of gingham picot-edged bias and the very full skirt is finished with a gingham border of scalloped Madeira applique. Yoke options include a picot-edged bias placket with buttons and a detachable square collar framed by the same picot bias or a smocked inset piped in gingham (pictured below) with a gingham sash tie. An ideal companion to this dress is a mid-yoke slip or the slip can be worn alone as a sundress. Spaghetti bias neatly finishes the neck and armholes while a generous ruffle hemmed with picot-edged bias provides a bit of flounce to the sundress or ends at just the right length to peek from beneath the Madeira hem of the dress. Eye-catching serger lace in the puff sleeves make a big impact on the simplicity of this waisted short sleeved dress. The fancy band style yoke and very full skirt are created with Victorian and lace insertions combined with rows of pintucks. The serger lace is created on English cotton netting giving the illusion of lace. A skirt placket and simple four button closure are used to finish the back and the waist gets a beautiful flourish with a wide satin ribbon. A beautiful party dress in a print. 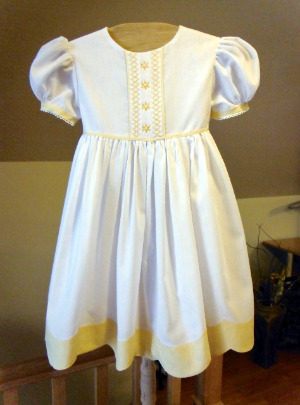 In a solid colour, such as white, this dress makes an exquisite flower girl outfit. (This style is also suitable for a christening gown). A baby's first Christmas was the inspiration for this sweet little dress of red & gold. Red velveteen was used for the simple bodice, the wide skirt hem band and the sleeve bands. The full skirt and the puffed sleeves in a red and gold print compliment the velveteen. Fancy gold ribbon bows add a festive finishing touch to the dress. Designed for a tiny flower girl, this beautiful dress is fashioned of cream Swiss cotton batiste accented with black piping, a scalloped Madeira style hem with black gimping and a wide embroidered black silk dupioni waist sash. The sleeveless bodice is diamond smocked in tone-on-tone cream. The center bodice embroidery is a bouquet of rosebuds and the same embroidery is echoed around the full skirt. An attached lace trimmed petticoat completes this outfit. Available in sizes 1, 2, 3 and 4. Starting at $180.00. Juliette, Juliette - where for art thou? Here she is amid ruffles and bows - a breathtaking yet simple and sweet dress. This is another versatile design that can be dressed up or down. Made in a more formal fabric or print (like the sample) and Juliette is a beautiful special occasion dress. Made in some fun quilting cotton prints and it's a perfect play dress. This is a perfect summer dress or jumper to wear a long sleeve shirt under. It can also grow well because next season it can be worn as a tunic with leggings or jeans because the straps are adjustable to fit a bigger girl. This dress features a slight sweetheart front bodice, a wide ruffled skirt and a big sash tie at the back with a unique knot fastening. The straps actually go through a large buttonhole in the back bodice and are knotted and tied, creating the fastening for the dress. Juliette - definitely not your ordinary reverse knot dress - definitely a dress any little girl would love. Available in sizes 1 - 8. $52 - $89 depending on size. Every little girl dreams about this ruffled confection called the Sugarplum Princess dress. Two ruffled skirts for extra fullness and ruffles down both sides of the over-skirt. A ballet style pointed bodice with a shirred back provides for a fitted yet comfortable look. The cap sleeves are also shirred and can be worn off or on the shoulders. Two generous ties make a big bow in the back completing this dress with an old fashioned yet timeless appeal. Oh Donna, Oh Donna, Donna where can you be? Our answer to that question is here. The Donna Dress is a classic dress, perfect for any occasion from special days such as birthdays or weddings, to just a garden party with the teddies on a beautiful sunny summer day. It features a crisscross front bodice and a low back bodice which closes with snap fasteners. The wide sash tie at the back and the bouquet of rickrack flowers at the waistline make it even more elegant! With it's full circle skirt, the Donna dress will have any little girl twirling and twirling and twirling.